This was yesterday's experiment. I had wanted a button or cabachon for a lily of the valley block I am doing in a round robin and, of course, could not find anything like that in the stash. I did manage to find a picture I liked on the internet and printed it out very small. I took a large-ish plastic button, about the size of a quarter, and used white glue to attach the picture to the flat back of the button. The picture is just on regular paper, by the way, not photo paper and it was printed on my regular inkjet printer. At this point I used E-6000 to glue the front of the button to some firm cotton fabric so I would be able to attach it to the block. Next I looked for advice from the girls at CQI and another group of friends to see what I could use to give the picture a glassy finish and avoid the ink running during the process. They had wonderful ideas to share with me but in the end I went with what I could find around the house since most of my stash is packed away in the trailer. I tested it on a scrap of computer printed paper and was pleased that the old bottle of base coat nail polish I found did not make the inks smear. I also tested this Sculpey Satin Glaze and it did smear the ink. So, on went three coats of base coat nail polish! After that was dry, I added several coats of the Sculpey glaze to give the piece the thick glossy coating I wanted. A word of warning though - best to allow a couple days for the glaze to dry thoroughly. I didn't and should have! So, here is the button sewn down to the block through the fabric showing around the edge. Now for the beads! And here it is completed! It was an interesting experiment and worth exploring again. I'll have to see if I can refine the process more. A question was brought up about transferring embroidery patterns to crazy quilt blocks so I thought I would share how I do it with tracing paper. First, either find a pattern you like and trace it onto a piece of tracing paper or you can draw one directly onto the tracing paper. I don't obsess about getting it perfect since it is basically a guideline. You can make adjustments as you are stitching. Baste the tracing paper onto your block where you want the design. Stitch the design onto the block right through the tracing paper. You don't need to necessarily stitch it all, just the parts you need. In this case I will be doing the lily of the valley blossoms with silk ribbon embroidery so I will add that after the tracing paper is removed. I have not made up my mind about whether I will fill in the leaves but with the outline in place I'll have that option if I wish. Sometimes I simply baste the design through the tracing paper and will do all the actual embroidery once the tracing paper is removed, using the basted lines as my guide. A lot depends on your design and what type of stitching you will be doing. When you have done as much of the embroidery as you want, remove the basting you used to hold the tracing paper to the block. Now just gently tear the tracing paper away. If you are too rough you can distort your stitching so take a little care doing it. Any small pieces of paper stuck under the stitches can be removed with tweezers. Now you have your embroidery, or at least the basics of it, on the block without having had to use any kind of marking pens that may give you trouble down the road. Yup, it's another dog post. Here is dd's sweetie, Duke the bloodhound. She took this picture of him under the kitchen table and I love that expression she caught on his face! So, what do you think it means? To me, it's like he's saying: "Oh..... it's you." roflol Likely it was just the start of a sneeze or something because he worships the ground she walks on but it sure is an interesting expression! Very Elvis Presley! I have been back on my sewing machine again this morning, this time piecing my blocks for the Pansies, Pansies, Pandies DYB Round Robin I am in at Crazy Quilting International. I am looking forward to this round robin - I have so many ideas for different ways to do pansies and I hope I'll get to try them all. 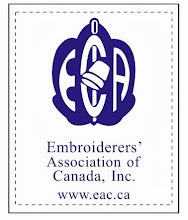 I am enrolled in a group correspondence course in crazy quilting through the Embroidery Association of Canada. I wanted to get the piecing done before I leave for the summer at the lake at the end of the month so today was the day! My inspiration for the purse was a gorgeous piece of velvet Cathy K sent to me in the Embossed Velvet Swap we had at CQI. I love this teacup! So moving on from that, I decided on a colour palette of black, gold and cream. This block will be folded into thirds: the back, the front flap and the front under the flap, so at this point you will have to look at the basted lines on the block and use your imagination to picture it folded up. This portion will be the front flap of the purse. I used another piece of embossed velvet as well, the black patterned one. This one was from the little workshop we had on this technique at the CQI retreat in Colorado last year. You can also see my first - yes, my very first! - curved patch. So, now that it is pieced I will pack it into the trailer and work on the embellishing at the lake. I'll report back on how it is going. Just a quick note - I thought that the photos of the art bras entered so far for the 2011 calendar at A Way to Women's Wellness were pretty inspirational - have a peek! Here is my darling daughter, Katie's, art bra she made for this year! And of course she is in this photo too! I am so proud of her for doing this in memory of her friend's mentor who lost her battle with this awful disease. It means such a lot to me I think because she has never shown much interest in stitching of any kind but took the challenge and made this! It has been a great time with the two of us discussing themes (obviously hers was fall), searching the stash and discussing options and techniques. And yesterday was just one more step in this trip as we went to our local thrift store and stripped off one of their mannequins temporarily to dress it in the bra and take photos. We heard some pretty fun comments as people walked by! Here is a bit more detail - the side straps are all covered by silk autumn leaves and the top straps are encased in the most gorgeous ribbon. The cups are crazy quilted and feature a piece of handmade embossed velvet. One more photo of the center detail - you can also see the embossed velvet in this one. Okay, proud momma will put her photos away now and not make you look at any more! lol Guess I better get moving on mine though now! I unexpectedly got to do some round robin angel work in the Fairies III DYB round robin at CQI. These blocks are a blast and I know I will enjoy stitching on all of them. I have just had the privilege of choosing one of Rita's blocks to work on. Here is the set of six she made - difficult choice! The fushia one was already done when they got to me so that was out of the mix. I finally decided on the little poppy fairy in the bottom right hand corner - I love poppies! And here is the block once I was done with it. You might recognize my last BAS seam there. I used seed beads to make a frame for the silkie. Below the silkie are two dragonflies made from gold beads and some really cool charms I found. These charms have the wings and body of the dragonfly and you can use your choice of beads to add to it for the head and tail. I thought they were really neat when I found them - they were something I had not seen before. I added beads and a line of metallic chain stitch to the lace trim that Rita had dyed and had on the block when she sent it out. I did pretty elaborate seam treatments so there wasn`t a lot of room left in the patches of this little six inch block for embellishment. I dyed a little flower motif and added it in the left corner. Also added some butterfly charms and a little button trail. My highlight of working on this block was getting to make this silk ribbon poppy. Might not look all that impressive but what a lot of effort went into it! lol It is from an idea in a book by Ann Cox. First of all I had to order some ready to dye ribbon - luckily Ribbonsmyth got it out to me very quickly. Then I went shopping for silk dyes - Shuttleworks had a nice selection of Chromacolour silk dyes so I got those. The colour I made to dye the ribbon was a mix of red, magenta and a touch of blue. Ironed the ribbon after to set the dyes and finally ready to stitch! The poppy is made of four gathered petals - the end of each ribbon is plunged through to the back and secured. The center is a tiny little piece of silk ribbon gathered around a firmer base (should have been interfacing and batt but I used part of a velvet leaf cut to shape) and one strand of DMC was used for the straight stitches as well as a chain stitch around the circumferance. Then stitched the center onto the middle of the petals using the same strand of DMC and stitching through the chain stitch. I am actually very happy with how it turned out which is great since I usually don`t like the end result of any silk ribbon embroidery I do. I think maybe the key is larger flowers using larger ribbons so will be going through the rest of Ann Cox`s A - Z of Silk Ribbon Flowers as I stitch on other blocks in this round robin. Anyway, that`s it and it is on its way to Australia now to the next stitcher. Hope she has as much fun as I did! The Way to Women's Wellness Art Bras are due in by June 1st. I have decided to make one for the first time after receiving encouragement from Vicki. I am very excited and the first thing I did was to send dd off to town to buy the right bra for the project. Well, I was surprised when she came home with two and announced she was making one too! Now, darling daughter is not a stitcher at all so that she would make this effort has me so pleased and proud. Here she is toiling away on her submission. She has been digging into my stash of ribbons, beads, etc. 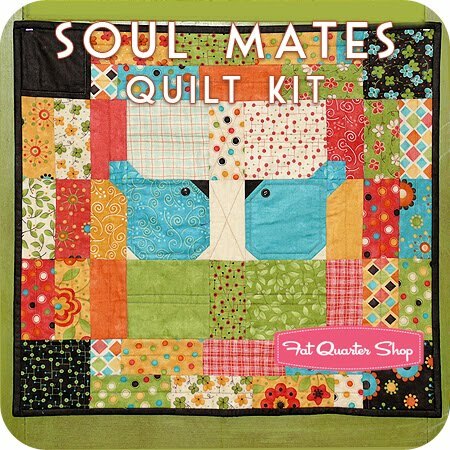 and has even announced that crazy quilting is kind of fun after all!! Well, here is what I did with the Open Chain Stitch to make a seam treatment. After I had done the open chain stitch with two strands of pale yellow DMC, I used red seed beads to attach gold Heisha Spacer Beads on every other step of the ladder. Next I used Gloriana Princess Perle Petite (#121 Holly Berry) to do a row of herringbone stitch on either side. I finished up using a soft green Japanese silk buttonhole thread to add a straight stitch cross on the base of each herringbone and three detached chain (laisy daisy) stitches on the top. I thought the Open Chain Stitch, or Ladder Stitch, looked pretty boring when I posted it for this weeks BAS Challenge, so I wanted to go ahead and see what I could do to make it interesting right away. I am happy with it. 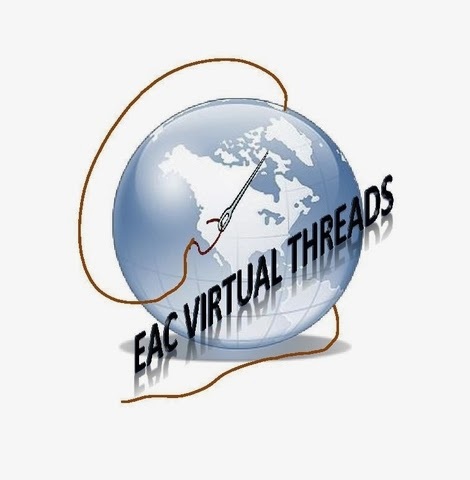 Are you wondering how I am getting any stitching done when I am still on the computer browsing around? lol Oh well, its just a little stitching break to let you know about this great giveaway Vikki is having at her blog. Check it out! 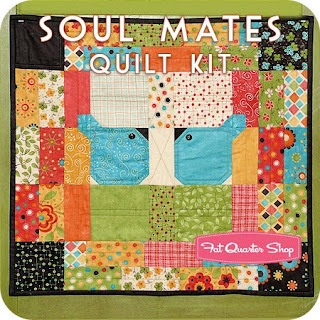 While you are at it, you can get up to six chances to win this wonderful kit called Soulmates over at Jaybird Quilts. Just adorable, right? And definitely worth a trip is the great giveaway at Bits and Pieces! Even if you do not win, you will be happy you visited that one and checked out the adorable clutch and pattern!! Look at what I woke up to this morning! Àpril showers bring May flowers my foot! So, here I sit on guild night, snowed in. Can you see the story in this photo? The green car is dd`s and she will attempt to get out and go to school. The little grey car is dh`s and as you can see he didn`t quite make it out of the yard with that to go to work. Now if you look at all the dirt sprayed all over the snow you can see where dh managed to get my truck out of the yard in order to take it to work..... my truck I was planning on taking to guild tonight! So, I am declaring this a snow day and will spend it stitching. I`ll share what I got done. My good friend, Cathy, is having a great giveaway of crazy quilting supplies on her blog, Crazy by Design, that you may want to sign up for. 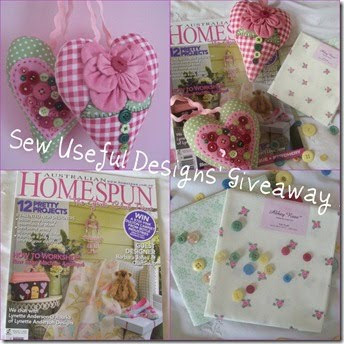 There are three prize packs, one each of threads, buttons and fabric. Very yummy stuff! You have until the 18th to sign up so you might want to get on over there! Yesterday was a quiet day here and I spent all day catching up on some 'sane' quilting. I love the Mailblocks group since they have a block lottery every month and everyone pledges so many blocks of the same pattern and then one lucky person wins them all - usually enough for a whole quilt. March's block was Monkey Wrench in white, light blue and dark blue. In spite of my resolution not to sign up unless I already have the blocks made, I couldn't resist this one. 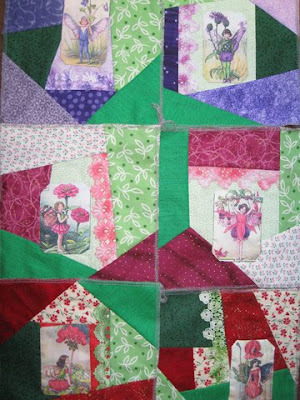 And, since I didn't win, I spent most of yesterday making the 8 blocks I pledged to mail to the lady with the good luck. This is how my eight blocks looked when they were all done and laid out together. I couldn't help thinking maybe my luck would change so I went ahead and made the blocks for April as well. Now I have them ready I will be on time mailing them out to the winner at the end of the month. This month the chosen block is Double Square and they are to be done in light and dark of whichever colour you choose. The winner of these blocks should end up with a nice scrappy looking quilt. I chose these light and dark greens for my blocks. Here they are laid out together. This block went together really easily - much quicker to do than the Monkey Wrench ones were. Anyway, it was a couple more things off my "to-do" list! We are having a small swap at CQI of handmade embossed velvet pieces. I had treated myself to some lovely velvet and some stamps from Hot Potato so this was a great chance to try them out. The first one was using a peacock feather stamp on purple. The embossed part turns mauve. I also used the purple to make roses and butterflies. With the red velvet I made a little spider - wouldn't it be fun to embroidery a gold web for him on the velvet? And the poinsettia stamp is probably my favourite! The dragonfly and key stamps turned out pretty well too. For anyone interested in embossing velvet, I posted a tutorial previously. It is the same method - just the results have improved using the Hot Potato stamps, better velvet and an iron with no steam holes. This is great fun to do and I am looking forward to seeing what I receive in return in the swap.